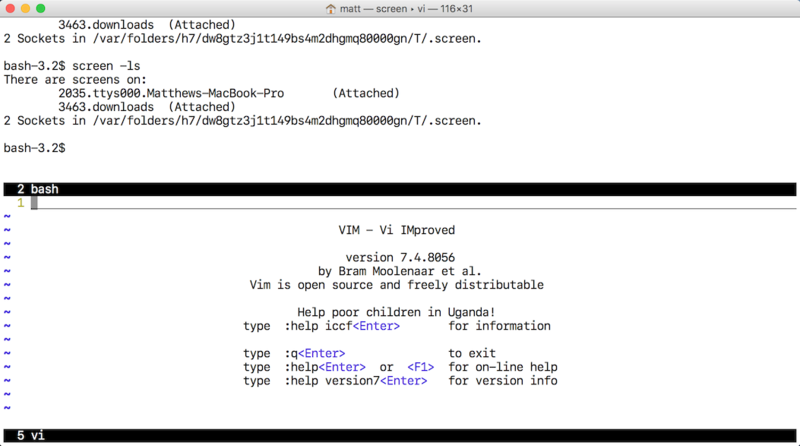 Screen (source code) is a terminal multiplexer implementation often used during Python development on Linux and macOS operating systems. Screen makes it easier for programmers to use many shells within a single terminal window while developing their applications. Screen is an implementation of the terminal multiplexers concept. Learn more in the development environments chapter or view the table of contents for all topics. Learn more about dev environments or move to editors? I'd like to learn about Emacs for Python coding. 1. Introduction 2. Development Environments » Screen 3. Data 4. Web Development 5. Deployment 6. DevOps Change Log What Full Stack Means About the Author Future Directions Page Statuses ...or view the full table of contents.